Give a Christmas gift to the little garden helpers. What a way to say "Thank you" to all those native bees and wasps tirelessly pollinating your fruit trees and vegetables, and disposing of aphids and caterpillars! If you provide them with places to hide and breed, they will work even harder for you. You will have more fruit and less pests. Just in time for the outdoors festive season, isn't it great? 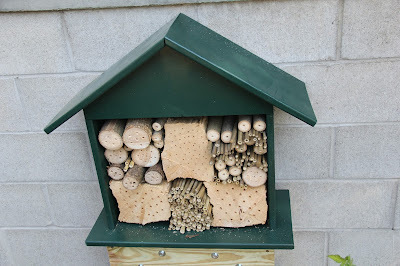 We will use small boxes, waterproof them, then pack them tight with various materials to create habitats for native bees: clay blocks with tunnels for blue-banded bees, bunches of soft-core twigs for reed bees, drilled hardwood blocks and bundles of hollow bamboo stalks for leafcutter bees. After the workshop you will return home with little insect housing to hang in your garden.